There is a third installment in the Mary-Kate and Ashley Olsen direct-to-video movie series that I have not yet recommended as a Movie Monday fave. This one takes place in Paris and is called Passport to Paris. The story doesn't change much from Winning London and When in Rome (the other two Olsen films), but it might be a little cuter to watch since the twins are younger and more adorable in this 1999 release. The two 7th grade sisters are sent to Paris to stay with their grandfather who leaves them under the supervision of a crotchety chaperone, whom they manage to escape from when they meet a couple of young French boys. 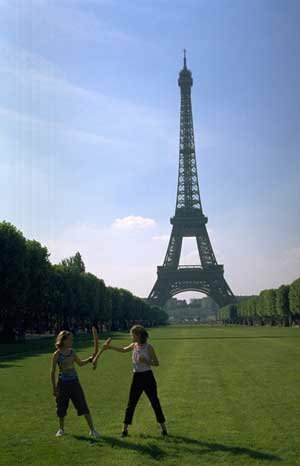 Tween and younger girls will probably love the story; others might just enjoy the Parisian scenery in Passport to Paris. My girls LOVE this movie. And When in Rome. We haven't seen the London one yet. Maybe I'll find that one for our next road trip.